Historically protected ballroom is a breath-taking beauty and a masterpiece of artificial marble, gold and crystal glass. It is located in the very heart of the Old Town quarter in the centre of Prague. It is one of the mythical places in Prague where the great parties and shows with dinner were regularly held until the beginning of the communism era. Traditional Czech Austrian 3 Course Menu. The dinner comprises three courses inspired by recipes from the Czech and Austrian cuisine. The dinner includes pea soup with buttered croutons, slow cooked beef cheeks in red wine and thyme, served with celery and potato puree, and home made apple strudel with almonds and vanilla sauce. Bon appetite! 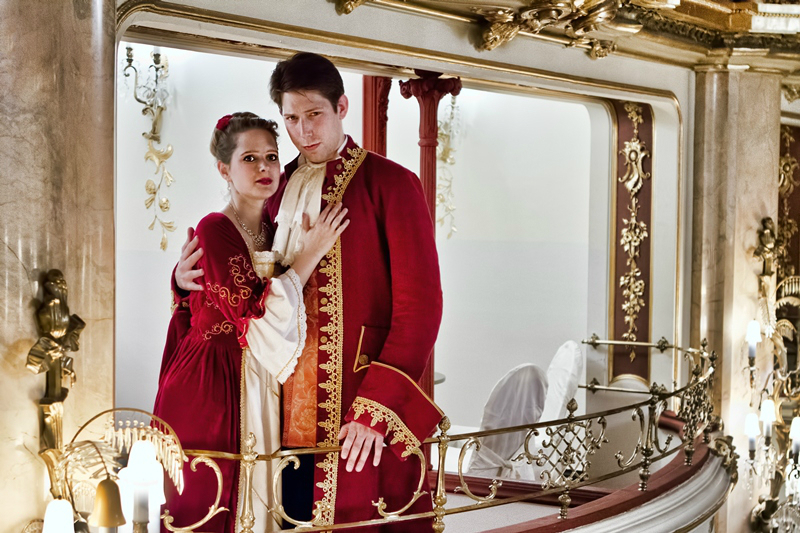 Excellent option to see an opera, in a beautiful place, super comfortable and that has existed for more than 400 years. The singers and musicians are excellent. The service is wonderful, with waiters polite and great food. I recommend to buy the ticket. An evening like this needs a 6-star rating to do it justice. This was the highlight of our visit to Prague. You will be captivated by the magic of Mozart. The setting is splendid, the musicians are magnificent, and the food is superb. We left feeling that if Mozart had been in the audience, he would have applauded as enthusiastically as we did. One of the best things we experienced in Prague. Highly recommended. Although there's a fixed menu, if you call in advance you can choose from optional menus. 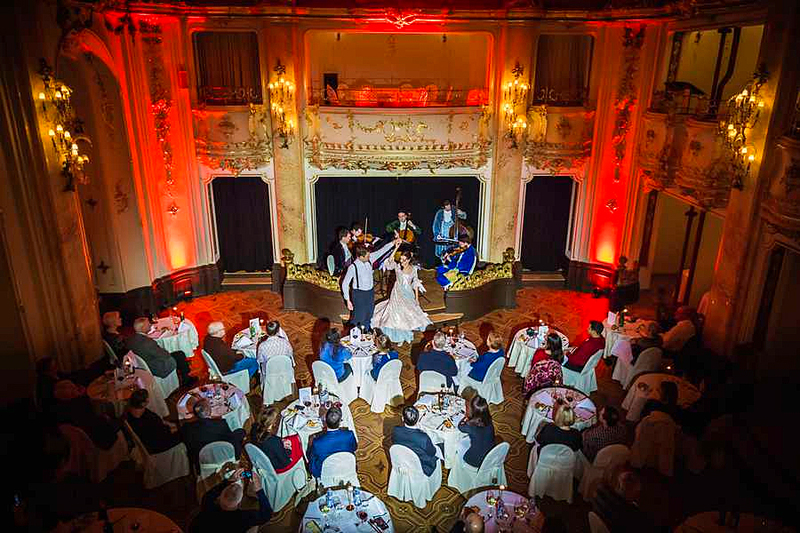 The building of the Grand Hotel Bohemia is from 1927 and the room where the show takes place had different uses since then. The show is very nice, the opera singers and the musicians are great! If you like Mozart, you can not miss it! It was a disappointing experience. Positives: The performers were good, some were funny but some lacked passion. some staff were friendly. Soup and main dish were tasty. Negatives: some performers looked like they lacked passion and that thry were performing for way too long. Most staff didn't speak English. Overpriced. Bathroom in the private balconies smelled bad. Dessert wasn't good. Drinks menu was limited. When buying tickets they said performers go to the private balconies which wasn't the case. I bought the tickets from the ladies at reception at the hotel itself, they are the ones that mentioned the balcony. Overall, I wouldn't recommend it. Every day, we help thousands of travelers plan great vacations. Here are some tips on how to use your Listing Page to attract more travelers to your business - Mozart Dinner. Promote your permanent link - https://www.inspirock.com/czech-republic/prague/mozart-dinner-a6138947343 - on your website, your blog, and social media. When a traveler builds a plan from this page, the itinerary automatically includes Mozart Dinner. This is a great way for travelers looking for a great vacation in your city or country to also experience Mozart Dinner. Promoting your link also lets your audience know that you are featured on a rapidly growing travel site. In addition, the more this page is used, the more we will promote Mozart Dinner to other Inspirock users. For best results, use the customized Trip Planning Widget for Mozart Dinner on your website. It has all the advantages mentioned above, plus users to your site can conveniently access it directly on your site. Visitors to your site will appreciate you offering them help with planning their vacation. Setting this up takes just a few minutes - Click here for instructions.